I don't believe that is the Bundy Couch. It's not. The Simpsons couch is there... I'm sure that's real. True, but they did have that Tron episode where they hit reality. lol. The couch was found on Craigslist along with a bunch of others. I have to find the article. Topic: How Many Action Figures/Dolls Were Put Out By ClassicTVToys? How Many Action Figures/Dolls Were Put Out By ClassicTVToys? I thought I counted something like 11, but I'm seeing ones that I might have missed. Anyone know? I think I have the first two series of dolls, but they made some more after that. These are the ones that came out back in 2005, I think. Topic: Married... with Children Comic Books Guide? Re: Married... with Children Comic Books Guide? I think she traded them for Tubro. I had them in my teens. I found out my mother threw them out. Damnit! Does anyone have the card that glued to the back of the box that lists what episodes are on what disc? I lost mine. 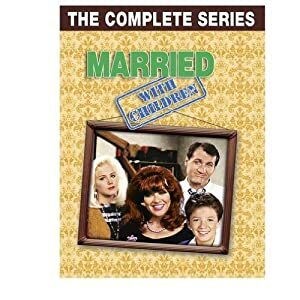 Married... with Children Comic Books Guide? Whatever Happened To The Bundy Couch? There's a photo of the cast taken back in 2010, and they're sitting on it, or a replica. Was it saved? It should have been put into the Smithsonian, like the Archie Bunker chair. Anyone know its fate? I loved the way she looked around the time of "Don't Tell Mom The Babysitter's Dead". I always loved her 60s inspired clothes too, with the cool jeans and crosses. Married with Children on Tumblr? I know of one to exist. Maybe the owner is a member on here? We should make our own!